Rhan o fap Sir Aberteifi gan John Seller, cyhoeddwyd yn wreiddiol yn Llundain tua 1694/5. Daw'r fersiwn yma o 'The Antiquities of England and Wales' gan Francis Grose, cyhoeddywd yn 1787. Seiliwyd y map ar waith John Speed. Maint y map yw 6 modfedd gan 4¾ ar raddfa o dua wyth milltir i un fodfedd. Scaniwyd y darn hwn ar 300 dpi. Mae'r map llawn ar 300 dpi (511KB) ac fersiwn ar 150 dpi, (344KB) yn cynnwys yr adroddiant, ar gael hefyd. 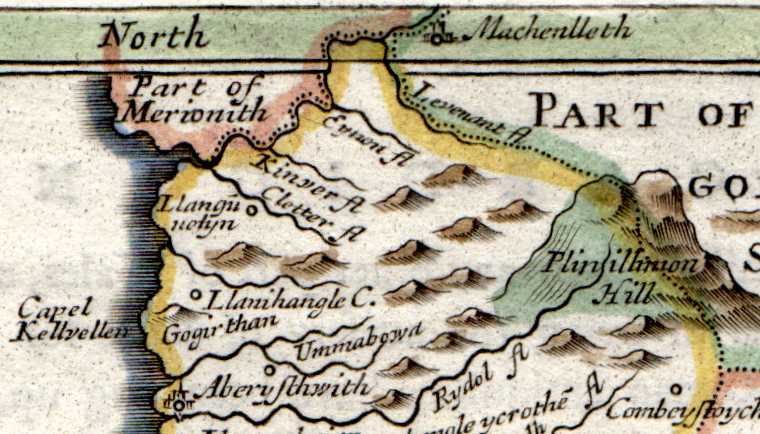 Gweler hefyd fersiwn wedi'i gyhoeddi yn 1701. 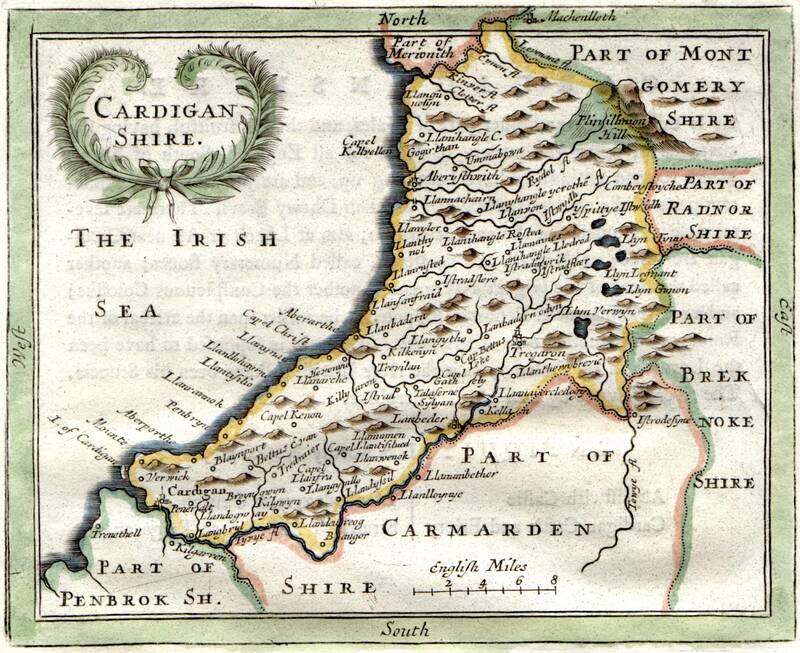 Part of a map of Cardiganshire by John Seller, originally published in London about 1694/5. This version comes from 'The Antiquities of England and Wales' by Francis Grose, published in 1787. The map was based on the work of John Speed. The map measures 6in by 4¾ in and is drawn at a scale of about 8 miles to the inch. This extract was scanned at 300 dpi. The full map at 300 dpi (511KB) and a version at 150 dpi, (344KB) including the narrative, are also available. See also a version published in 1701. Is a maritime county in South Wales, which was antiently inhabited by the Dimetiæ, and by the Romans included in their Province of Britannia Secunda. It is in the province of Canterbury, diocese of St.David's, and Western circuit of South Wales. 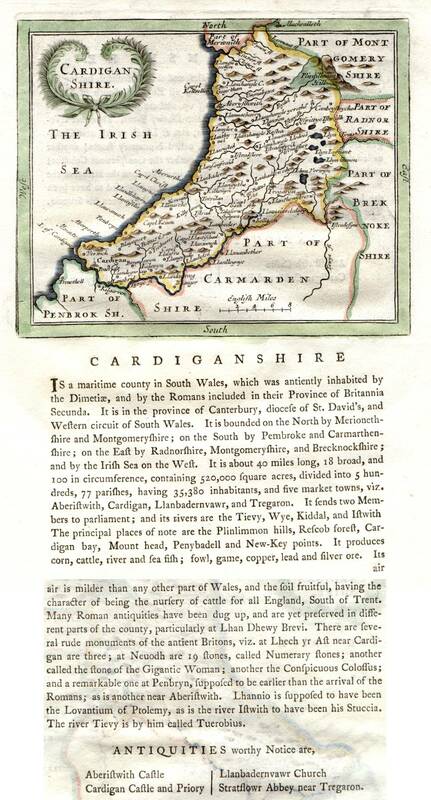 It is bounded on the North by Merionethshire and Montgomeryshire; on the South by Pembroke and Carmarthenshire; on the East by Radnorshire, Montgomeryshire, and Brechnockshire; and by the Irish Sea on the West. It is about 40 miles long, 18 broad, and 100 in circumference, containing 520,000 square acres, divided into 5 hundreds, 77 parishes, having 35,380 inhabitants, and five market towns, viz. Aberistwith, Cardigan, Llanbadernvawr, and Tregaron. It sends two Members to parliament; and its rivers are the Tievy, Wye, Kiddal, and Istwith. The principal places of note are the Plinlimmon hills, Rescob forest, Cardigan bay, Mount head, Penybadell and New-Key points. It produces corn, cattle, river and sea fish; fowl, game, copper, lead and silver ore. Its air is milder than any other part of Wales, and the soil fruitful, having the character of being the nursery of cattle for all England, South of Trent. Many Roman antiquities have been dug up, and are yet preserved in different parts of the county, particularly at Lhan Dhewy Brevi. There are several rude monuments of the antient Britons, viz. at Lhech yr Ast near Cardigan are three; at Neuodh are 19 stones, called Numerary stones; another called the stone of the Gigantic Woman; another called the Conspicuous Colossus; and a remarkable one at Penbryn, supposed to be earlier than the arrival of the Romans; as is another near Aberistwith. Lhannio is supposed to have been the Lovantium of Ptolemy, as is the river Istwith to have been his Stuccia. The river Tievy is by him called Tuerobius. ANTIQUITIES worthy Notice are, Aberistwith Castle, Llanbadernvawr Church, Cardigan Castle and Priory, Stratflowr Abbey near Tregaron.